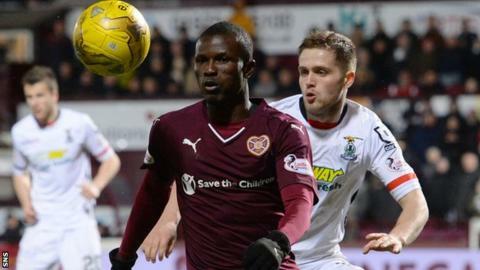 Inverness Caledonian Thistle's Scottish Premiership match against Hearts on Tuesday is off because a virus left the away side with "few fit players". The match at the Caledonian Stadium will now be played on Tuesday, 12 April, with a 19:45 BST kick-off. Up to 12 Hearts players have been suffering from gastroenteritis and an under-20s match was cancelled to provide cover. Head coach Robbie Neilson was concerned about the bug spreading. "Players had been away on Scotland Under-21 duty and a couple of the guys from other teams had had it," he told BBC Scotland. "They came back here, John Souttar had it and it looks like it has spread from there and all five of them that went away last week with the 21s were down with it and a few other guys as well. "The worry is that it then spreads even further through the club and possibly even up to Inverness with the Inverness players. "So, the doctor's made the decision we're going to have to close this place down for two days, get it cleared out and hopefully by the time we come back in on Thursday be ready to go. "If we finally get up there next Tuesday, that'll be the third attempt to get the game played and we're desperate to get it done. It's three journeys, three hotels paid for, three bus journeys paid for so it's been an expensive trip this time." The Scottish Professional Football League said in a statement Hearts applied for the postponement as the majority of their first-team squad were affected by injuries or illness and they had only one fit goalkeeper over the age of 16. It added: "The Heart of Midlothian FC doctor has provided written evidence to the SPFL of the injuries and sickness of all those affected and has also advised of the potential for further infection, both of other squad members and of players and staff of Inverness Caledonian Thistle FC. "In these exceptional circumstances, the SPFL has agreed to the postponement request." Hearts are scheduled to play Aberdeen at Tyencastle on Friday evening. "It's important that we get Friday's game done and then try and get the game done next Tuesday because it's an important period for everyone, not just ourselves but the other teams as well trying to get into the top six," added Neilson.